It’s a hot, sunny summer morning in Trenton, and more than 100 kids are scattered throughout the tennis courts at Cadwalader Park. With counselors and volunteers intertwined throughout the facility, the kids practice hitting serves and run through a variety of drills. But more importantly to NJTL of Trenton (NJTLT) Executive Director Rob Howland, the kids are learning greater lessons along the way. Spend five minutes at the park, and it’s obvious that NJTLT is about much more than tennis. The organization focuses on life skills and education, using tennis as a hook to get kids interested and engaged. That effort results in a major impact on the Greater Trenton area each year through after-school and school-day programming, academic enrichment, employment opportunities as teaching staff, college preparation, scholarships and partnerships with local clubs. Recently, NJTLT’s dedication to that educational component led to the development of the Academic Creative Engagement (ACE) Curriculum, which was designed to encourage academic achievement, health/wellness and social/emotional skills. ACE, now owned by the USTA, is being utilized by other NJTL chapters all over the country. It focuses on math, literacy and health while including decision making, problem solving and teamwork. “Combining the education with tennis has led to a great experience for participants,” Howland said. That was the goal all along for the NJTL of Trenton, which until 2008 was operating from an extra bedroom inside the home of former Executive Director Dan Faber, who now heads USTA Foundation, the charitable arm of the United States Tennis Association. Howland’s experience with the organization dates back to 1998, when as a teenager he worked as a tennis instructor for the organization. Back then, NJTLT had no full-time staff, but always had the big picture in mind. NJTLT has steadily climbed in resources, size and opportunities since then, now serving more than 2,500 kids per year and taking steps toward doing even more. 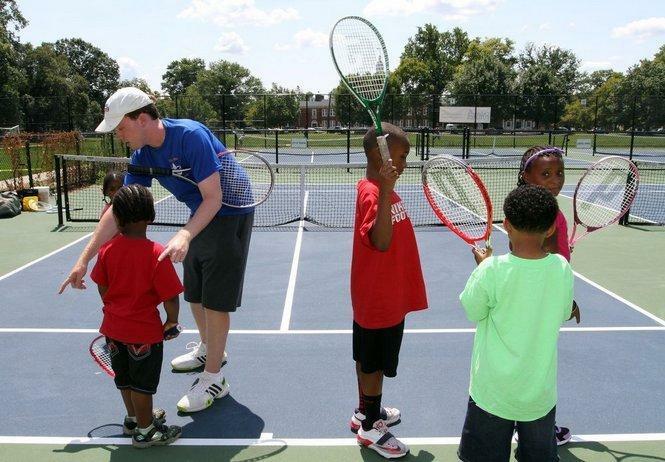 In 2011, NJTLT opened its Junior Champions Tennis Center in Cadwalader Park, which transformed the run down clay and hard courts into 14 10 and Under courts and seven regulation-sized courts. The organization’s public/private partnership with the City of Trenton, Friends of Cadwalader Park and the USTA is now in excess of $1 million. It has taken thousands upon thousands of hours along with countess sacrifices by staff and donors but Howland can now say the NJTL of Trenton is set to take yet another step forward. On Friday, August 15, NJTLT will host its grand opening and dedication of the Daniel L. Haggerty Jr. Pavilion at the Junior Champions Tennis Center. The 600-square-foot pavilion completes the final step in a three-step process to complete the rejuvenation of the park’s tennis facility. The Pavilion, named in honor of the longtime Trenton resident who served as director of the city’s tennis program for 17 years, features a second-story deck that will host spectators while they enjoy matches, a Wi-Fi access point, space for equipment storage, and learning tables for NJTLT’s educational programs. NJTLT is gifting the $160,000 pavilion to the city. Friday’s event will feature a group of tennis and political dignitaries and will showcase an exhibition match between star tennis figures Jim Courier and Todd Martin. All will be in celebration of the park, the tennis facility and the programs NJTLT is running for the community. “It’s the culmination of a lot of hard work and people who donated money and time to help make this happen,” Howland said of the project. Now the largest youth-focused tennis facility in the nation, the Junior Champions Tennis Center in Cadwalader Park is open for public use, serving as a bright spot in an area in need of its services. What previously held a number of run-down, under-utilized courts is now state-of-the-art, being used for public play, youth programming and local events. It has changed that part of the park and has the opportunity to multiply its impact as it continues to grow and develop. Anyone on hand Friday will see that, loud and clear. A limited number of seats are available free of charge for the dedication and match. They can be reserved by emailing Claire Shevlin at cpshevs@gmail.com. A post event VIP cocktail reception with the players will be held at Trenton Country Club. Tickets and additional information can be found at www.njtloftrenton.org.